OK, I promised, so here we go! The other seven parts of this series have all dealt with the technical aspects of vSwitches, pNICs, Port Groups and such. This part will deal with the more mundane aspect of naming standards. While maybe not as glamorous, this is definitely one of the most important aspects of building your virtual infrastructure. Oh, by the way, the names I used in this series of article (i.e. PG_APP1, PG_VMotion, etc.) are really bad names for a production environment! OK, we’re now up to Part 4 in this series of articles. With a title like “The Great vSwitch Debate” I bet you’re wondering when the debate’s going to start – well, not yet. I’ve still got a few more details to cover about what makes a vSwitch tick before I can really get into the discussion of what’s the best way to configure your vSwitches. OK…in Part 1 of this series, we introduced the concept of a vSwitch and touched on some of the options available. In Part 2, we talked about some of the security features available in the vSwitch. In this Part 3, we’re going to talk about the load balancing features that are available in the vSwitch. In this post, I discuss vSwitch functions, Port Groups, VLAN tagging/trunking, valid communications paths, and some other basic vSwitch information. In Part 2, I cover the vSwitch security features (Promiscuous Mode, MAC Address Change, and Forged Transmits) as well as network traffic shaping options. 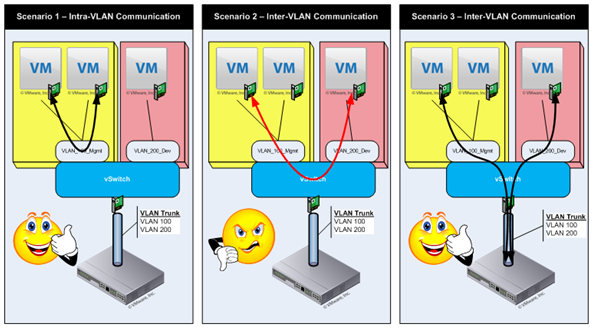 Here I discuss the various load balancing options that are available in a VMware vSwitch. In Part 4, I cover fault detection and the Cisco Discovery Protocol. In Part 5, I talk about the various networks that you have to contend with in an ESX environment as well as an approach to help in deciding which networks to combine, if you have to. I introduce the first host configuration. In this part, I talk about my recommendations for when you have eight pNICs and offer up a couple alternatives, including one for using an iSCSI initiator from within a VM. I discuss configurations for systems with two, four, and six pNICS. In this, the final article in the series, I discuss the importance of naming standards. This article is a continuation of the first in a series. See The Great vSwitch Debate – Part 1 for the beginning of the series. In this Part Two of the series on vSwitch configurations, I want to address some of the advanced configuration options, but first – I need to go back and revisit the end of Part 1. There, I was discussing the routing of traffic between VMs on the same and different port groups on a single vSwitch. I presented the figure below (Figure 1) to describe what I was talking about.